Look at these pictures (click on either to enlarge it). Everything in these picture with the exception of few objects with pointy projections (stars) are individual galaxies off in the distance. This photographs are the famous Hubble Deep Field (below first), Deepest Field (below second), and Extreme Field (below third), and they vividly demonstrates that galaxies are everywhere. Just where did all of this stuff come from? What is happening to it today? What is the future of the Universe? This unit hopes to provide some information for you, and then you can draw your own conclusions. The photograph seen above in the middle is called the Hubble Ultra Deep Field, taken in the spring of 2004. The Hubble Space Telescope had been updated by a NASA Shuttle mission and with the improved optics, this telescope is able to take clearer, sharper, and deeper images than ever before. I think this photograph is even more impressive than the 1996 Deep Field at the top of this page. But the science team at the Hubble Space Telescope center just had to look farther. They created this picture entitled the Hubble Extreme Field. 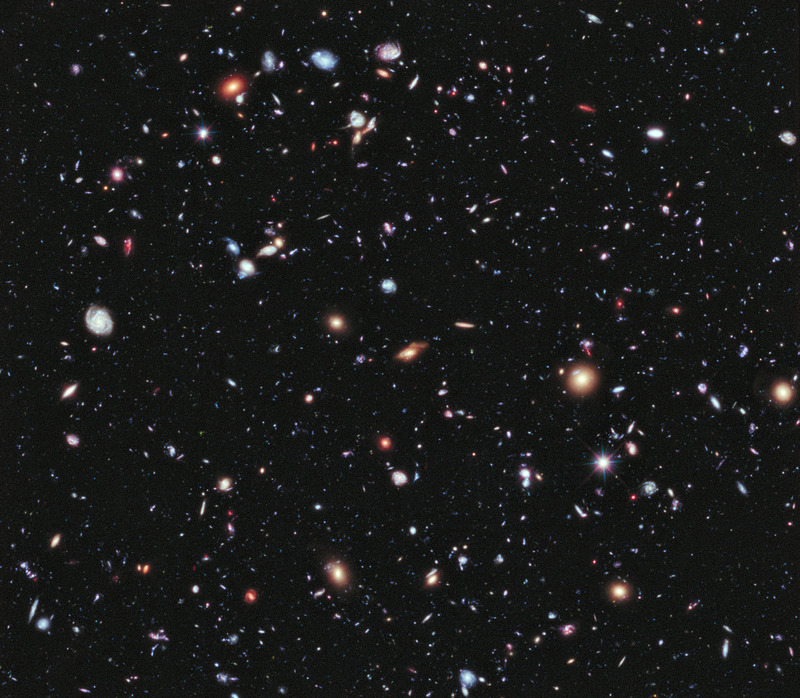 The Hubble Extreme Field is a small portion of the Ultra Deep Field image, and focuses on a piece of the night sky that is equal in size to the little box relative to the full moon as seen in this pictorial perspective. Hundreds of hours of exposure time went into the creation of this incredible image that sees things that are really far away and really far back in time ... like to a time when the Universe was only .5 billion years old. OKAY, 500,000,000 years old is pretty old, but it is a pretty small fraction of the overall of the Universe that is some 13.7 billion years old, so this picture is pretty cool! To get a relatively good picture of how all of this material is organized, go to Large Scale Structure of the Universe. The diagrams in the pages to come represent my simplified approach to teaching the Big Bang Theory of the origin of the Universe. There are few topics in all of science that pose threats to students more than Big Bang cosmology and Evolutionary Biology. Once again, I hope to not make any offensive comment or teaching toward or against any particular religious persuasion. I only hope to present to you what scientists have concluded from empirical evidence through rigorous experimentation. There are holes in both of these theories, and that is why we use the term "theory" to describe them. In no manner am I attempting to convince anyone to believe in one thing or another. One of the great aspects of living in America is that most sacred freedom to worship. I encourage you to read, read some more, and then read even more. Look at the evidence that science has uncovered, and then compare those results to your religious beliefs. Challenge both and then take your stand. But, please do not simply accept any teaching, whether in your church, mosque, or synagogue, as well as in any classroom, public lecture, or television documentary. You owe it to yourself to check the evidence and make your own conclusions ... just as Luther and Copernicus boldly did so many centuries ago. Will the Universe implode or continue to explode. This depends on our understanding of basic cosmological principles. So, you now go where no man has ever gone before, and in the words of Buzz Lightyear, "To infininty ... and beyond!" The image above shows Buzz Lightyear, as he was taking a break from his Star Command duties of rescuing the Universe from Emperor Zurg. Buzz was kind enough to pose for a quick picture with my daughters before going back to work. I would like you to start at Olber's Paradox first. You could check out a great Cosmology website, or go to the Syllabus .